Currently enrolled students and active employees can now use Office every day for school, work and activities that are most important to them. 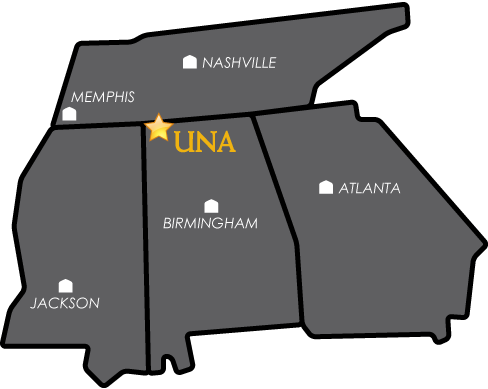 There is no cost to download and run Office products on your personal devices through UNA's Office 365 subscription. This includes the Microsoft Mobile apps on smartphones and tablets. NOTE: If you need Office 2016 on a UNA-owned computer, please email helpdesk@una.edu for assistance. Who can install and use the Office products? The subscription covers all currently enrolled UNA students and active UNA employees with an Office 365 account (UNA email account). You can install the newest version of Office, currently Office 2016 for Windows and Office 2016 for Mac, on up to 5 devices. What Operating Systems can I install the Office products on? The Office 365 installation will work on computers running Windows 7 or greater, and Mac OS X 10.6 or greater. However, updating to the latest OS will allow you to take advantage of many benefits not supported on the older OS versions. What is included with Office 356 license? Will I be able to keep Office once I graduate or leave UNA? No. The Office 365 activation is tied to your UNA email account. You must log into Office 365 at least once every 30 days so Office can verify that you are still an enrolled student or active employee. If you are or were a student who is no longer enrolled, or no longer employed by the University, and access to your email has been removed, the office installs you performed under the account will become read-only, so you will not be able to edit files with them. Instructions on how to download, install, and activate the software are listed below. 1. Using the computer on which you wish to install Office, go to https://outlook.com/una.edu and use your UNAPortal ID and password to log in to your Office 365 email account (email helpdesk@una.edu if you do not know your UNAPortal ID or password). 2. Once logged in, click on the settings gear in the upper right corner, scroll down to the "Your app settings" section at the bottom of the menu and select Office 365. 3. From the Settings page, select Software: Install software. 4. The system will detect the operating system you are running and recommend the latest version of Office for you to install. Once you verify the version to install, click the Install button. 5. If you are prompted to Run or Save the file, select Run. If your only option is to save the file, save it somewhere you will be able to find it easily, then navigate to that location on your computer and run the installer (the installation file will end with .exe for Windows or .dmg for Mac). 1. If you selected Run in the download instructions above, Microsoft Office will already be installing. If you selected Save, navigate to the .exe and double-click on it to start the installation. After a few minutes you will receive notice stating “Welcome to your new Office.” At this screen click Next. 2. Follow the prompts through the installation, selecting the options you want. 3. When all options are selected, a video will play explaining some of the features of Office. Once the video is done, it will ask you to Sign in. At the Sign in prompt, enter your username@una.edu email address, and click Next. 4. Follow the remaining prompts and when complete you can begin to use the Office products. 1. If you selected Run in the download instructions above, a Microsoft Office 2016 window will open. If you selected Save, navigate to and double-click the .dmg installer to open the Microsoft Office 2016 window. Inside the Microsoft Office 2016 window, double-click the "Office Installer.pkg" to launch the Office for Mac 2016 installer. 3. Once Office has finished installing, the Office Setup Assistant will open. Select Sign in to an existing office 365 Subscription and enter your UNA email address. 4. Choose Organizational account and enter your UNA email address and Unaportal password. Click Sign In and begin using your Office products. iPhones/iPads - go to the App Store and search for Microsoft Office Mobile. Android devices - go to the Play Store and search for Microsoft Office Mobile. 3. After the installation is complete, open the app. 4. When prompted, enter your UNA student email address. 5. Select Organization account and type your Unaportal password.